The Kings had many more shots on goal than the Rangers, but the shot-attempt totals were close to even: 64-63 in favor of the Kings. Doughty’s lack of recognition could also be attributed to a bit of East Coast bias, but he has been miscast and underrated even in Los Angeles. Early in overtime, however, Girardi stumbled while back-skating after the puck took a weird hop off his stick in the defensive zone, and his soft clearance attempt from one knee was intercepted along the wall just inside the blue line by Mike Richards. The Blueshirts somehow are going to have to muster their start to Game 1 and more as this series continues. Otherwise, the most memorable part of the franchise’s first Final appearance in 20 years will be the five hype-filled days they spent waiting for it to begin. When these two teams reconvene for Game 2 on Saturday, there will be some good the Rangers can take from this performance — almost all of it in the opening period. That’s when they staked themselves to a 2-0 lead behind goals from Benoit Pouliot and Carl Hagelin, then watched as the Kings, this group of seemingly eternal resilience, began to push back. Defenseman John Moore has now completed his two-game suspension, and will be eligible to return for Game 2 on Saturday night. With Raphael Diaz doing an admirable job in his place, Vigneault will have a decision to make on who to play. Hagelin, the Rangers’ best player besides Lundqvist, said the Blueshirts, who had 27 shots on Quick, overpassed. The Kings didn’t get here by rolling over, of course, so the 2-0 deficit after Hagelin’s short-handed goal was merely a speed bump, not a wall. And the third period was not exactly what the Rangers wanted. 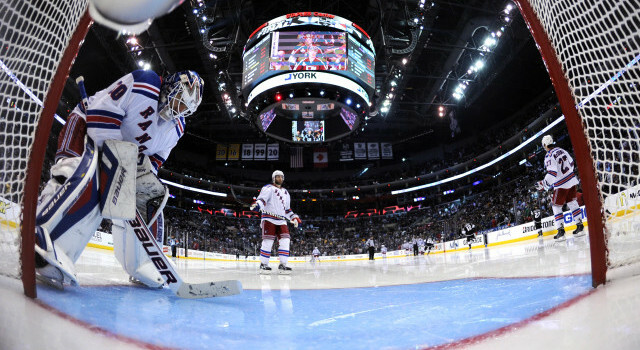 Eighteen Rangers made their Stanley Cup Final debut–including backup goaltender David LeNeveu who dressed in the place of the injured Cam Talbot. The only two Rangers with prior Finals experience who played Wednesday night were 2004 Stanley Cup champions Brad Richards and Martin St. Louis. And that’s just it about these Los Angeles Kings: They can score at will, it seems, to the tune of 3.46 goals per game in these playoffs, tops in the NHL. These are not your 2012 Kings who made the 2-1 victory a staple of their championship journey. 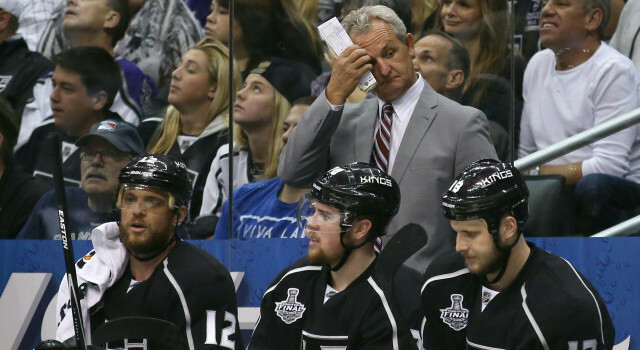 The Kings out-hit the Rangers 45-33. Rangers defenseman Marc Staal admitted his squad wasn’t used to the heaviness of the Kings’ forecheck. Angry Drew Doughty eventually made up for the error with a second-period goal that will be Exhibit A if he ends up winning the Conn Smythe Trophy as playoff MVP. Heralded as the one reason the Rangers might have a chance of preventing a lopsided series, Lundqvist made 20 saves in the third. He held his team in it and preserved a 2-2 draw until the end of regulation, even with the Kings awarded a power play in the final 1:36 of play. The Kings also won in overtime in Game 1 of the 2012 Stanley Cup Final against the New Jersey Devils (2-1); they won that series in six games. Los Angeles has won six straight series after taking a 1-0 series lead. When Staal talks about how the Rangers could have played better, he’s talking about the third period, which was a nightmare for New York but not a costly one because of the play of goaltender Henrik Lundqvist, who faced 20 shots in that 20 minutes and stopped them all. The process of cleaning up their issues began in the final 20 minutes of regulation. Los Angeles put together a period of dominant even-strength hockey that exceeded anyone’s expectation of how 5-on-5 play could go in this series when the Kings are rolling. As far as other Rangers who stood out, McDonagh played a strong game at both ends of the ice, while Hagelin’s speed was again on display and effected the game. Rick Nash also was very involved, registering three shots on goal, and winning puck battles in the offensive zone.